John and Sarah Ann Thirkell Poole: Poole’s were not the first homesteaders but were one of the first to build a home. They were both born in England and immigrated to America as converts to the Church of Jesus Christ of Latter-day Saints. John was born September 6, 1833, in Preston, Lancashire, England to William and Elizabeth Stockton Poole. (At the time of his homestead proof his father submitted an affidavit that John was born in New York City on the above date). The Poole family was among the first to move to Nauvoo in 1840. Thirkells came to New Orleans then to Council Bluffs. Sarah was born September 18, 1837, in Hutton Buschel, Yorkshire, England to John and Mary Brown Thirkell. Both families settled in Grantsville, Utah Territory where they were neighbors and the two married June 25, 1854. For the next twenty years they lived in Weber County then in Salt Lake. 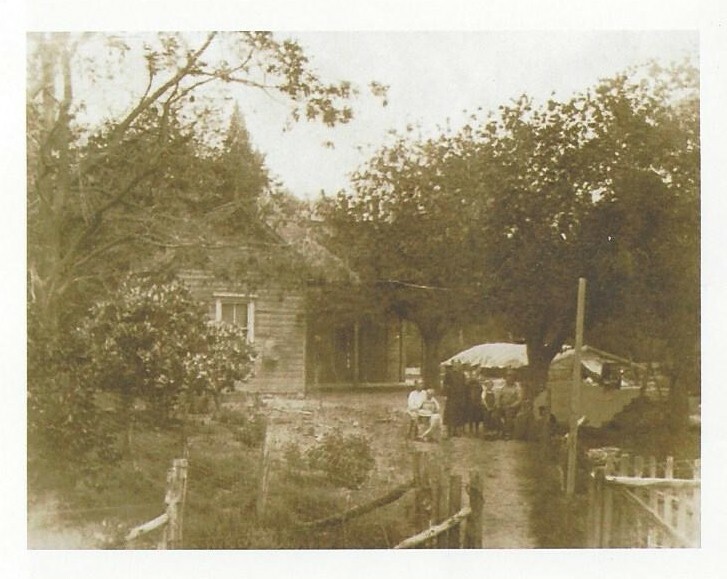 They moved to Highland in 1873 with nine children: Sarah, Minnie, Mollie (Mary) (Minnie and Mollie were twins), John, William, Eva, George, Chauncy, and Arthur. Their daughter, Loretta, had died at seven months of age before they moved here. Their home (#39 on the 1958 Highland map) was built in 1873 close to the center of his 160 acre homestead at the Northeast corner of 10400 N. and 6000 W., near the Lehi ditch. The home was built of adobe with lumber on the inside of the walls and was 15 x 26 feet while another account said it had two bedrooms. 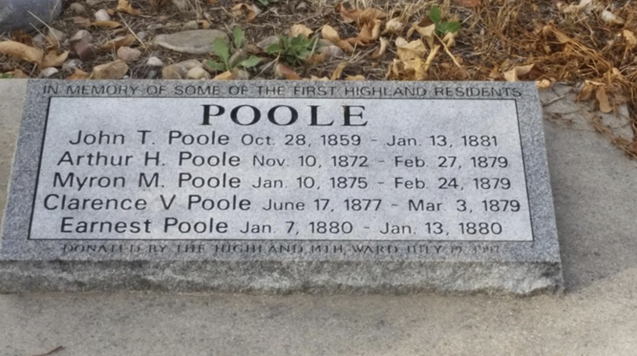 Four more children were born to the Poole’s after their move to Highland: Myron, Clarence, Ernest, and Royal, so it would have been pretty crowded in any case. Myron, born January 18, 1875, was the first boy born in Highland. Their daughter, Minnie married John A. Jenkins September 7, 1878, and they filed for homestead of 160 acres directly northeast of her parents. John died September 25, 1879, just more than a year after their marriage. In 1877 there was a severe drought and Lehi said “no more water for Highland”. John Poole was one who defied them and used the water anyway, leading to the lawsuit which gave Highland some water rights. In 1879 tragedy struck the Poole family when 3 of their children: Arthur, Myron and Clarence, died of diphtheria within a week of each other. One year later a 6 day old baby, Ernest died also, then another year later their oldest son, 21 year old John, was killed in an avalanche in American Fork Canyon where he was working as a guard at the Pittsburg Mine. Upon a call from Bishop McCullough of Alpine, a number of Highland and Alpine residents went up and recovered his body at their own peril, for the snow was still sliding around them, and brought it down for burial. John had gone to work in the mine with “Doc” Sperry, against his mother’s wishes. The five children are buried in a plot on their property, which has been preserved to the present (2018). The Poole’s became disenchanted with the Church and decided to move to California and left Highland on July 26, 1884. They later moved back to Salt Lake City in 1896. John died December 28, 1898, and Sarah died November 3, 1917, after helping to organize the Unitarian Church in Salt Lake. Their home was occupied until ­­­­1942 when it was burned down by the owner, David Strasburg.